Silver has always been one of the precious metals that customer look out to purchase after gold because of its amazing returns. It has this brilliant surface which makes it logically appealing. Being more moderate than gold and valuable stone, it has built up all through and holds the limit of profiting. That’s the reason that people invest in silver items for cash. This makes it a perfect investment tool for the people in silver jewellery like Chains, Rings, Coins, Pendants, Anklets, Bracelets, Earrings and Bars. 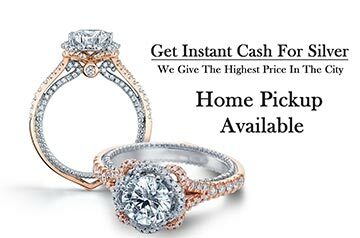 CASH FOR GOLD hold's 20 years long history in this market of selling and purchasing. What's more, we provide cash for silver in any condition whether broken, divided, or in pieces in sterling silver. Everything is sufficient.